Created by RocketCat Games and priced at $2.99, the Mage Gauntlet app is essentially a single-player adventure game for iPhone. Mage Gauntlet looks like it could be an old Super Nintendo title straight from the sixteen-bit era of video gaming. The player guides Lexi on a journey to prove himself worthy to a wizard named Whitebeard. Players are armed with a magical gauntlet with which they can cast various spells. The quest brings players in contact with several other characters that help progress the story which essentially has a save-the-world spin to it. 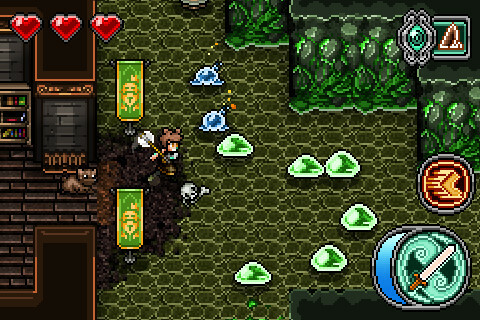 Mage Gauntlet is controlled as you would typically expect on the iPod Touch , iPhone or iPad . Digital buttons grace the right side of the screen and a completely transparent joystick sits on the right. The controls may be a bit difficult for players more used to hard buttons, but I found it gets easier with play. The position of the joystick is fluid, so Lexi may be moved around by touching anywhere on the left side of the screen. The basic move-set consists of a melee attack that strikes with the weapon Lexi is equipped with at any given time and a dash attack that is initiated by pressing and holding down the attack button. These two attacks suffice for play in the beginning of the game , but more advanced moves are needed in the later stages. Where Mage Gauntlet sets itself apart from other adventure games is in its magic system. Throughout the journey, players will encounter magical urns that contain spells. Players can keep up to four spells at once and can activate them by tapping the button on the top right of the screen. This brings the game to a pause and opens the magic menu which displays the available spells. Spells are sparse, however, so players must use them strategically. To increase the chances of finding a particular spell, players can equip Lexi certain trinkets. Mage Gauntlet’s appeal will depend on what sort of gamer you are. It seems to me that old-school gamers from the 16-bit era are the most likely to enjoy it and feel a ting of nostalgia. The length of play is certainly worth the price, particularly if you fight every monster and search for every secret. Additionally, finishing the story once unlocks master mode, the highest level of difficultly, and adds additional secret areas and extras. The game runs pretty smooth with few hiccups. 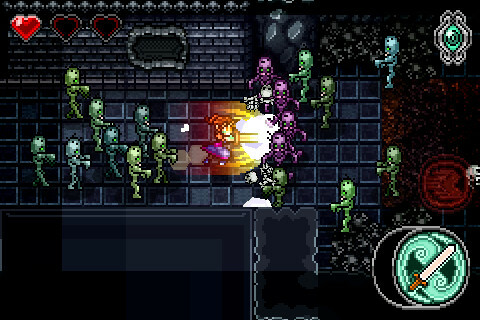 Mage Gauntlet’s iPhone is likely to perform better on the iPhone 4S with its faster processor than on the iPod touch. AppSafari review of Mage Gauntlet was written by Darius Reimm on October 25th, 2011 and categorized under Adventure, App Store, Games, RPG. Page viewed 4229 times, 3 so far today. Need help on using these apps? Please read the Help Page.